Our bagels are available in the following varieties: natural, poppy-seed, whole wheat and rye, onions, pumpkin seeds, sunflower seeds, everything, sesame, cinnamon & raisins, spinach and tomato-provencal. 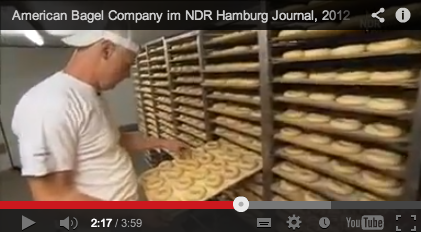 The American Bagel Company is baking also vegan and Kosher and is certified by the Jewish Chabad Centre Hamburg. Our muffins are available in these varieties: brown chocolate, chocolate chips, blueberry, banana & chocolate, cranberry-orange, and vanilla. Our cookies are available in the varieties double chocolate, white chocolate chips, and brown chocolate chips. We also produce original american carrot cakes and american brownies. AVAILABLE ON REQUEST: Our donuts are available in these varieties: brown chocolate icing, caramel icing, with sugar and white sugar icing. Donuts according to original American recipes. The American Bagel Company supplies mainly retailers, such as cafés, coffee shops, bakeries, restaurants, hotels, and caterers. Delivery service within the city of Hamburg. Deliveries throughout Germany, Europe and worldwide by expert frozen foods logistics partners. Bienvenue sur le Bagel Bakery Américaine Bagel Company! Pour obtenir plus d’informations, veuillez consulter notre site et en anglais s.v.p. Bienvenidos a la Panadería Bagel! Para obtener más información por favor visite nuestra página web en inglés. Willkommen bei der Bagel Bäckerei American Bagel Company! Für weitere Informationen sehen Sie bitte unsere Seiten auf Deutsch.